When Moses Magnum was attempting to rebuild his economic base, he took over the country of Canaan, located next to Wakanda. Magnum was stealing secrets from the Wakandan mainframe, but his activities were found out by Deathlok, who was in the employ of T’challa. Magnum sent the mercenary Killjoy to assassinate T’challa. Killjoy was stealth enough to gain entry into the Wakandan palace and into the bed chambers where T’challa and Monica Lynne lay asleep. Killjoy was thwarted by Deathlok in his attempt. 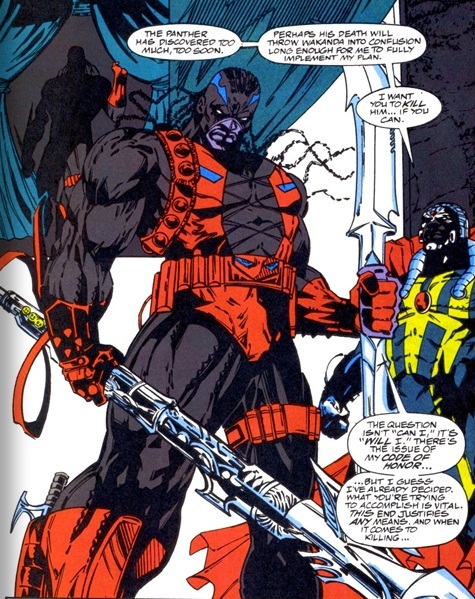 Killjoy then wielded his adamantium sword and cut Deathlok’s arm off. Deathlok was able to recover and chase down Killjoy, who was arrested and imprisoned in a Wakandan prison (Deathlok #22-25).